COL Brian Farley (center) passes the 10th Brigade colors to the New York Guard’s Chief of Staff, COL Larry Bishop, who will then pass the colors to COL David Molik (right) the new commander of the 10th Brigade, New York Guard. Sergeant Major Thomas Czurlanis (left) first presented the colors to COL Farley. Passing the Colors represents the orderly transition of command within a military unit, as officers move on to other assignments. 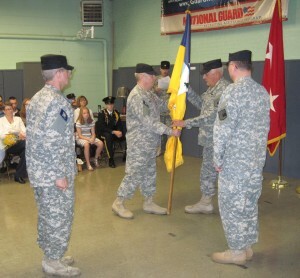 TROY-- A Change of Command Ceremony was held at the State Armory at 99 South Lake Avenue in Troy on September 15th, 2012. COL Brian P. Farley, of Albany, Commander of the New York Guard’s 10th Brigade since 2003 was succeeded by COL David Molik of Ballston Spa. Colonel Larry Bishop, Chief of Staff of the New York Guard was the Reviewing Officer, Sergeant Major Thomas Czurlanis is the ranking NCO for the Brigade. Piper Bill Munro, Schenectady Pipe Band, provided a fitting musical support, playing The Minstral Boy, The Army Song (The Caissons Go Rolling Along) and The Gary Owen. At the change of command, Colonel Farley was awarded the New York State Conspicuous Service Medal for his actions as commander of the 10th Brigade since 2003, leading the Brigade at Fort Drum during Operations Phoenix Warrior and Patriot East, supporting and preparing regular Army, Army National Guard, US Air Force, Dutch and Belgian Air Forces for combat operations. Colonel Farley was acting brigade commander at the time of the terrorist attack on the World Trade Center on 9/11/01 and led the brigade those those difficult days in New York. Colonel Farley is the recipient of numerous awards and citiations. Colonel Molik is the recipient of numerous awards and citations for his military leadership during numerous military support operations related to the crash of TWA Flight 800, the terrorist attack on the World Trade Center on 9/11/01, various natural disasters, blizzards, floods, tornadoes and ice storms and was an integral part of Operation Vigilant Guard. Colonel Farley, a practicing attorney in his civilian life, is a graduate of St. Bonaventure University and Western New England School of Law. Colonel Molik, a Supervising Administrative Law Judge with the NY State Office of Children’s and Family Services, is a graduate of SUNY Buffalo and SUNY Buffalo Law School. Colonel Farley is married to the former Valerie Urbaetis and they are parents of a son and a daughter. Colonel Molik is married to the former Patricia Youngers and they are parents of 3 sons and a daughter. Colonel Farley’s new position is as Deputy Chief of Staff for the New York Guard at Camp Smith Training Site in Courtlandt Manor, NY, a position vacated by Colonel Molik. Following the ceremony, a luncheon was catered for the officers and soldiers of the 10th Brigade, sponsored by the Tenth Brigade Association.